Jesus warned His disciples: “If they persecuted me, they will also persecute you." Today, as much as at any point in history, that warning is a lived reality for the global church. But perhaps those thoughts simply betray our own lack of understanding and poverty of spirit when it comes to prayer. We can pray! We can enter the throne room of the King of the universe (Hebrew 4; Revelation 4), a privilege granted to us at the highest possible cost, and we can present unrestrained requests on behalf of our persecuted brothers and sisters, knowing that God hears, that He sees their circumstances perfectly, that He cares more than we could ever know, and that He can and will act. Persecuted Christians understand this. That is why one of the first things they ask when we meet them (and one of the last things they ask as we leave) is: ​“Please pray for us.” They believe that the prayers of Christian brothers and sisters on the other side of the world – your prayers – will make a tangible difference to their circumstances. They believe that your prayers will help them to stay faithful under the strain, help them to love and forgive their persecutors, help them to share their faith despite the pressure, help them to receive the practical resources they need, help them to experience justice and greater freedom – all this, because you pray. They believe that the prayers of Christian brothers and sisters on the other side of the world – your prayers – will make a tangible difference to their circumstances. Prayer is the vehicle that God has chosen to unleash His compassionate action in the world. By praying, ​“we couple the powers of heaven to our helplessness” (O. Hallesby, Prayer). This is where our response must start. We can pray! Each November the International Day of Prayer for the persecuted church (IDOP) brings a necessary focus to our persecuted Christian family. It is a cross-denominational, cross-organisational campaign designed to alert, motivate and equip the global church to call out to God on behalf of our brothers and sisters who suffer for their faith. Every year local congregations across the world embrace this vision in their Sunday services or in special events organised in their town. IDOP is a powerful statement of Christian unity on this pressing issue that necessarily impacts the whole body of Christ: ​“When one part suffers, we all suffer together” (1 Corinthians 12:26). Of course, praying for persecuted Christians should not be restricted to one Sunday in November. It should be firmly integrated into our rhythm of prayer throughout the year and the focus generated at IDOP is designed to stimulate an ongoing prayer concern. Release International is dedicated to inspiring the church in the UK and Ireland to pray for our persecuted brothers and sisters. We were founded 50 years ago through the inspiration of Pastor Richard Wurmbrand, who was himself imprisoned and tortured for his faith for 14 years in communist Romania. 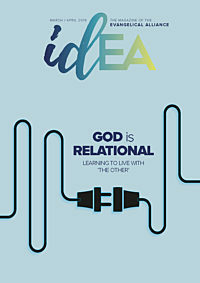 Together with the Evangelical Alliance Religious Liberty Commission members, Release is at the forefront of promoting and resourcing IDOP in the UK church. You can find ideas and resources to help you organise an IDOP event at relea​sein​ter​na​tion​al​.org and follow daily prayer material in our Prayer Shield prayer diary. In his autobiography Tortured for Christ, Richard Wurmbrand issued a penetrating call to the church in the West on behalf of persecuted Christians. He said: ​“Do not abandon them.” A fundamental part of responding to that call is to pray, to cry out to Almighty God individually and corporately, regularly and intensely, in the firm belief that He will answer. This IDOP, will you respond to that call to enter the throne room of God on behalf of your persecuted brothers and sisters and present their requests to our loving heavenly Father? Father God, we cry out to you with one voice on behalf of our persecuted brothers and sisters around the world. We know that you see their situations and that you love them so much more than we ever could. We ask you to comfort them in their affliction, to give them your strength to persevere, and to help them love their enemies. We ask you to provide the material support they need, to give them justice, and to enable them to share and express their faith. We ask you to help us remember them, to know the details of their stories, and to pray for them. In the name of our Lord Jesus, who fully understands what it is to suffer persecution. Amen.